Following Apple recent iPhone 4S launches in Hong Kong, South Korea and rest of the countries on November 11th, the company has not yet published any recent press releases detailing the iPhone 4S upcoming launch schedule. 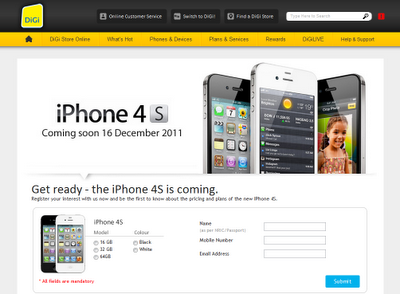 Maxis, DiGi and Celcom are set to launch the iPhone 4S on December 16th. Maxis and DiGi have opened opened up the Registration of Interest (RoI) page online for customers to be the first notified regarding the iPhone 4S launch details. You may register in the links given. Lelong.com.my last 2 weeks sold 2 iPhone 4S by auction at higher prices (RM 2,675 for a 16GB iPhone 4S and RM 3,120 for a 32GB iPhone 4S) ahead of the official launch, but over the years with each different generation iPhone release, the price gets cheaper by several hundred Ringgit. The iPhone 4S official price is being estimated to be cheaper than the current iPhone 4 price. Apart from the iPhone 4S launches in Malaysia, Brazil, Philippines, Russia, Saudi Arabia, South Africa and Taiwan are reported to get iPhone 4S on the same day — 16th December 2011. You're right. Thousands of people walked home happily with their new gadget. A lot of techy guys sure is waiting for this launch.